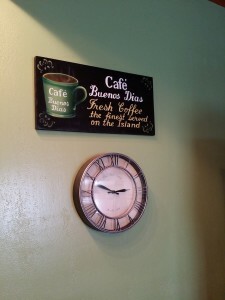 We searched for months and months to find a rental home in Roatan, Honduras for our vacation. We needed a place for 4 adults and 3 kids. Rikaine at Life Via Rikaine and I researched so many places our eyes were starting to gloss over. We weren’t quite sure where to stay so we researched the towns in Roatan first to get a feel for what would fit us best. That turned out to be West Bay Beach. And let me tell you we were NOT disappointed. We found a lot of awesome rental options on VRBO. This site is awesome! You’ll have to check it out. I’ll write more on VRBO in another post. But right now I wanted to give you a tour of the Roatan Honduras Casa Coral house rental (where we stayed) and Casa de Paradise (it’s sister house) plus the apartments on their grounds as well. This place was amazing and fit us to a T. It couldn’t have been more perfect. Thanks Myra & Evelyn for everything. We were met by family and picked up by our driver at the Roatan airport. The driver made a pit stop at the grocery store and then we went on to the the rental house. If you ever have this many people in your party, I would recommend that you go straight to the house and set up a time later to go shopping. The arrival at the property went great. We were met by Evelyn, the house manager. She was SO awesome. She was there every step of the way and was very personable. The house was in tip top shape, clean and awaiting our arrival. First order of business was to get some pictures of the house. We were so excited to get checked in, drop everything off in the house and get some lunch and of course see the beach which was RIGHT THERE. I couldn’t believe how close it was. It was perfect! 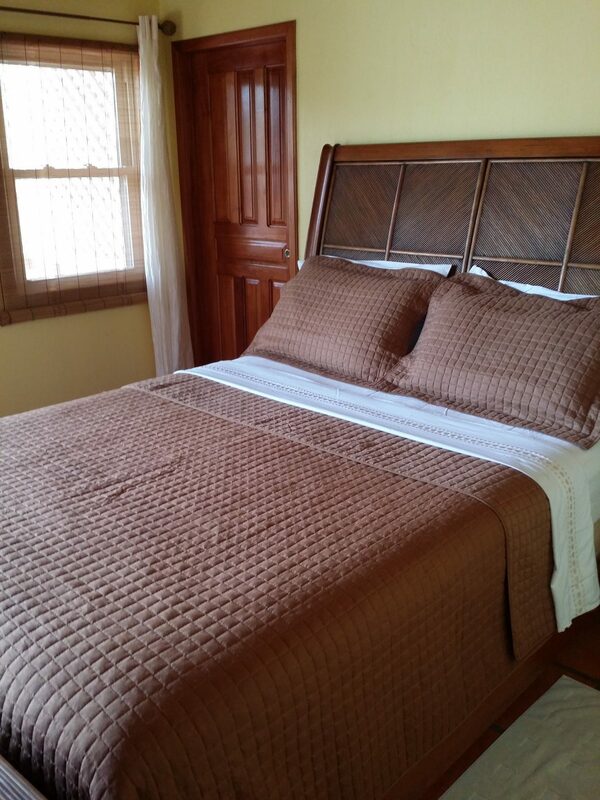 As you walk in the house (Casa Coral) there are two bedrooms on the main level each with their own air conditioner. There is one immediately to your left with a private balcony and large bathroom (shower only). The second bedroom is to your right as you walk in through the living area and it also has it’s own balcony and private bathroom (with bathtub). Kev and I chose the first room and were not disappointed. The shower was huge and I really liked it. As you walk in towards the kitchen there are winding stairs that take you to the top floor which also has 2 rooms with air conditioners. These rooms each have their own small bathroom and balcony too. There is an extra twin size bed in the loft area, between the two rooms overlooking the living/kitchen area. On the opposite side from that extra bed is a sitting area with a table to play games. What a great space! Like I mentioned each room had their own bathroom so there was a total of 4 bathrooms in the Casa Coral portion of the house we rented. 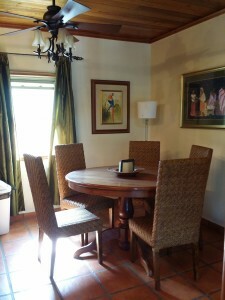 There is a 1st floor apartment at Casa Coral too. No one was renting that when we were there but it really wouldn’t have been a problem at all if there was. Bathrooms were clean and had really good hot water. There were bath towels and beach towels too. The bathrooms in the loft bedrooms were small but clean and perfect for the teens. The kitchen had everything one would need. It had pots, pans, plates, silverware, etc. There is a microwave, water cooler, coffee pot and we brought a French press for coffee too. In addition there is a BBQ grill outside which we used a lot. We cooked in a lot which saved money and it was great to have some home cooked meals. 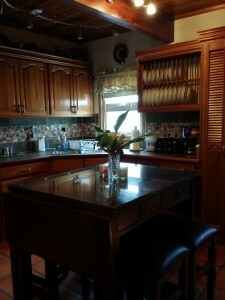 The kitchen island was great for preparing meals and lighting was good throughout the house. We stocked up at the grocery store and had lots of fridge and shelf space to put away everything we bought. We even made brownies! The round table had ample space to eat and play games. The living area was right next to the kitchen and was comfortable with a leather couch and love seat. We were there 14 days so the house got a full cleaning during our stay. The house manager and others were always professional and fun to be around. Always accommodating when we had questions or needed to exchange towels. 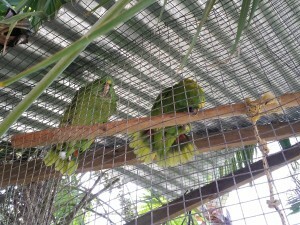 One of my favorite things about the Casa Coral rental home were the two talking parrots. They are hilarious and kept us in stitches with their antics. There are 5 gallon water bottles available that were convenient and we could refill throughout our stay. There were two picnic tables, chairs and a BBQ grill. There were 3 kayaks, a few beach loungers, floaters and life vests too. The outdoor showers always came in handy to rinse ourselves AND the equipment off after a day on the sandy beach. And there is a basin to rinse your feet and shoes off before you go up the stairs to go inside. Be considerate and use it so the ladies have less work to do. We actually kept the house swept and as clean as possible. Don’t leave food out on the counters and wash them well or you’ll take up residence with an ant colony. Just steps from the rental house is the most beautiful beach I have ever seen. There is a private area before you hit the main part of the beach for renters that has chaise lounge chairs. If you turn right you’ll find a few yummy restaurants, shops, another resort and more. Turn left and you head towards the action. You’ll pass many resorts and people trying to sell their wares and services. Definitely grab an empanada or listen for the man calling out, “banana doughnuts.” I didn’t care for the doughnuts but he and his wife were so cool we purchased them anyway. We came prepared with snorkels and masks but you can rent all that stuff along the beach if you need to. You just have to see how beautiful West Bay Beach is. The coral reef is the 2nd longest barrier reef and is just spectacular for snorkeling. I’m sure diving is amazing there too but we don’t dive. Kev and I even snorkeled the whole length of the beach back to our rental home. I want to go back! 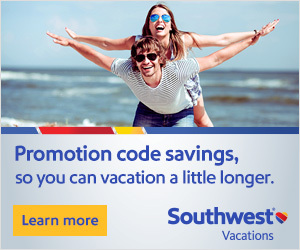 We paid just under $2900 for two full weeks. Totally worth it! We paid up front by credit card and I was able to have Myra keep our card on file for the required deposit. The booking was simple and I truly felt at ease handing over our info to her. 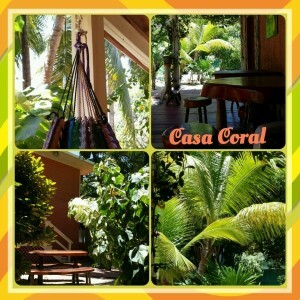 Casa Coral and Casa de Paradise is located on West Bay Beach at the Emerald Bay Beach Club in Roatan, Honduras. We were set back off the beach and well off the main road and felt very safe. The house had free WiFi and use of a local cell phone. The power went out quite a bit but that’s how it is on many islands. Power is SO expensive in Roatan so be sure to turn off lights and stuff when you aren’t using it. We made the best of the power outages and hit up the beach most of the time. We were given fresh ground Honduran coffee upon arrival from the owners coffee farm on the mainland. It is packaged on the property and was delicious so of course we had to purchase some to take home. The house manager even showed us how the cooling process works, it was really cool and smelled so divine. So glad we brought our French press. This was our first booking through VRBO and it was a great experience. Like I said, I will write more about VRBO in another post. Overall the accommodations were great. Yes we would absolutely stay again if we had a big group traveling together. 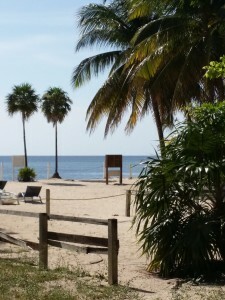 Kev and I are thinking of sometime spending a week in Roatan by ourselves so we would either rent a smaller unit on this property or try something new down further towards West Bay and the end of the beach near the Grand Roatan resort. Have you ever traveled to Roatan, Honduras? We stayed right up the road at Casa Azul. Ron (Myra’s husband) was watching over the place we stayed at. He gave us some coffee and showed us his awesome roaster. Great area to stay. First Time Cruisers: Where are we headed?